A recent introduction from England. 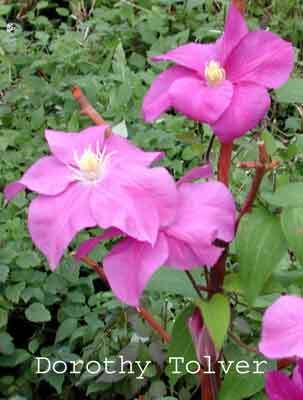 This cross between Vyvyan Pennel and Niobe has 6" (15cm) deep mauve pink flowers set off with yellow stamens. The blooming time is late spring and again in early fall. Mature height is 8-12' (2.5-3.5m).Pruning group B1.